This article presents the results of a peer-reviewed systematic literature review combined with expert opinion of the preferred management of pleural infection in adults for clinicians in the UK. The clinical guidelines generated from this process are presented in figure 1. The guidelines are aimed predominantly at physicians involved in adult general and respiratory medicine and specifically do not cover in detail the complex areas of tuberculous empyema, paediatric empyema or the surgical management of post-pneumonectomy space infection. 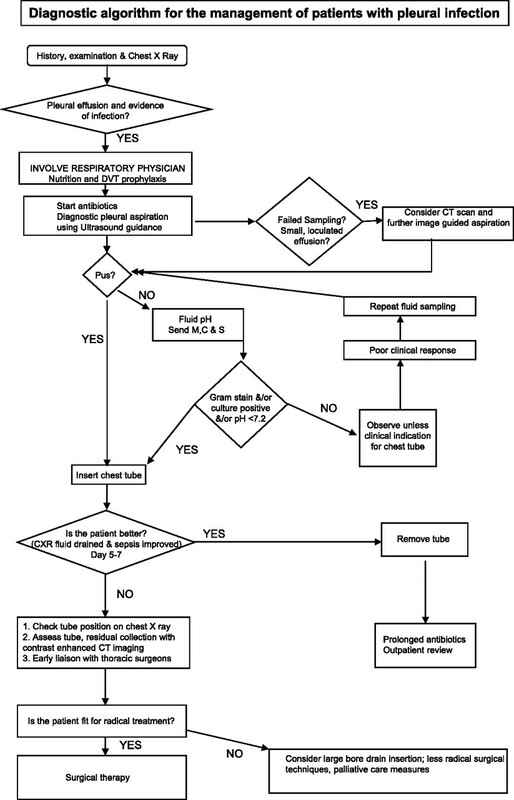 Flow diagram describing the management of pleural infection. This section provides background information for reference, interest and to set the management guidelines in context. The Egyptian physician Imhotep initially described pleural infection around 3000 BC, although Hippocrates has been more famously credited with its recognition in 500 BC. Until the 19th century open thoracic drainage was the recommended treatment for this disorder but carried an associated mortality of up to 70%.4 5 This high mortality was probably due to respiratory failure produced by the large open pneumothorax left by drainage.5 This was particularly true of Streptococcus pyogenes infections which produce streptokinase and large alocular effusions free of adhesions.5 Closed tube drainage was first described in 1876 but was not widely adopted until the influenza epidemic of 1917–19. An Empyema Commission subsequently produced recommendations that remain the basis for treatment today. They advocated adequate pus drainage with a closed chest tube, avoidance of early open drainage, obliteration of the pleural space and proper nutritional support. These changes reduced mortality to 4.3% during the later stages of this epidemic. Risk factors for pleural infection mirror those for pneumonia although independent considerations for developing empyema include diabetes mellitus, immunosuppression including corticosteroid use, gastro-oesophageal reflux, alcohol misuse and intravenous drug abuse.2 A history of aspiration or poor oral hygiene is often elicited in anaerobic infection. Iatrogenic pleural infection following pleural interventions and thoracic or oesophageal surgery, trauma or oesophageal perforation account for the majority of remaining cases. Many patients have no apparent risk factors. In health, the volume of pleural fluid in humans is small (<1 ml), forming a film about 10 μm thick between the visceral and parietal pleural surfaces.14 Pleural fluid contains protein at concentrations similar to the interstitial fluid, a small number of cells (predominantly mesothelial cells, macrophages and lymphocytes) and some large molecular weight proteins such as lactate dehydrogenase (LDH). Compared with serum, pleural fluid in health also contains greater levels of bicarbonate, lower levels of sodium and similar levels of glucose.15 The pH of normal pleural fluid is around 7.6. These parameters change when disease processes affecting the adjacent lung or vascular tissue activate an immune response. Pneumonia leads to about 110 000 emergency hospital admissions each year in the UK,16 and the standardised incidence of hospitalisation is increasing (1.98 per 1000 in 2004–5).16 Up to 57% of patients with pneumonia may develop a pleural effusion17 18 but, if appropriate antimicrobial therapy is instigated early, the fluid usually resolves. Most forms of pleural infection represent a progressive process that transforms a ‘simple’ self-resolving parapneumonic pleural effusion into a ‘complicated’ multiloculated fibrinopurulent collection associated with clinical and/or biochemical features of sepsis. This may significantly impair respiratory reserve and necessitate surgical drainage. Empyema is the presence of pus within the pleural space. If appropriate treatment is not commenced, a simple parapneumonic effusion may progress to the fibrinopurulent stage with increasing fluid accumulation and bacterial invasion across the damaged endothelium. Bacterial invasion accelerates the immune response, promoting further migration of neutrophils and activation of the coagulation cascade leading to increased procoagulant and depressed fibrinolytic activity.20 21 27 Increased levels of plasminogen activator inhibitors and decreased tissue-type plasminogen activator (tPA) are seen which favour fibrin deposition and promote formation of septations within the fluid.20 Neutrophil phagocytosis and bacterial death fuel the inflammatory process by the release of more bacteria cell wall-derived fragments and proteases.21 This combination of events leads to increased lactic acid and carbon dioxide production resulting in a fall in pleural fluid pH,28 accompanied by increased glucose metabolism and a rise in LDH levels due to leucocyte death. This leads to the characteristic biochemical features of a fibrinopurulent but not overtly purulent collection that is pH <7.20, glucose <2.2 mmol/l and LDH >1000 IU/l consistent with a ‘complicated parapneumonic effusion’.17 Frank pus is termed ‘empyema’. The final stage is the organising phase in which fibroblasts proliferate.21 A solid fibrous pleural peel begins to form which occasionally encases the lung preventing re-expansion, impairing lung function and creating a persistent pleural space with continuing potential for infection. Pleural infection may also develop without evidence of pneumonia—so-called ‘primary empyema’. The microbiological features of pleural infection have altered significantly in modern times, particularly since the introduction of antibiotic therapies in the 1940s. Pathogens isolated differ between patients with community or hospital-acquired pleural infection (table 1) and iatrogenic aetiology, for example, following thoracic surgery. Acknowledgement of the differing bacteriology should help to guide empirical antibiotic therapy. An appropriately experienced physician requires the skills to identify patients for surgery and assess thoracic surgical risk, as well as expertise in managing the substantial comorbidities often present. A chest physician best combines these skills as well as having the advantage of an established liaison with thoracic surgical colleagues. In centres with thoracic surgery immediately available, care may be under a physician with a surgical opinion appropriate at any stage in a patient not settling with drainage and antibiotics. Poor nutrition was identified during the First World War as an adverse determinant of outcome from pleural empyema but is frequently overlooked. Patients with pleural infection suffer catabolic consequences which may lead to further immunodeficiency and slow recovery. Hypoalbuminaemia is associated with a poor outcome from pleural infection1 and clinicians should provide adequate nutritional support and consider supplemental enteral feeding (ie, nasogastric feeding) from the time of diagnosis. All acutely ill patients with pneumonia and/or pleural infection who have been admitted to hospital should receive prophylactic dose low molecular weight heparin treatment unless contraindicated (eg, bleeding, thrombocytopenia, significant renal impairment, allergy to low molecular weight heparins).60–65 In patients with renal impairment, unfractionated heparin should be used (5000 units subcutaneously twice daily). Mechanical prophylaxis and thromboembolic deterrent stockings should be used in those with contraindications to anticoagulant treatment. For patients in hospital with community-acquired pneumonia the median time to improvement in heart rate and blood pressure is 2 days, and 3 days for temperature, respiratory rate and oxygen saturation.66 A failure to respond to initial management may indicate the presence of a parapneumonic effusion or empyema as a complication of pneumonia. Indicators of possible progression of pneumonia to pleural infection include ongoing fever and symptoms or signs of sepsis—for example, elevated white cell count and/or inflammatory markers such as C reactive protein (CRP). CRP is a sensitive marker of progress in pneumonia.67 68 Failure of the CRP level to fall by 50% is associated with an adverse outcome and increased incidence of empyema69 and should prompt further evaluation including a repeat chest x-ray. A recent study70 used a number of pneumonia severity scores and clinical variables to predict the likelihood of development of complicated parapneumonic effusion and empyema in patients with community-acquired pneumonia. None of the severity scores had any predictive value but seven clinical variables were identified predicting development of pleural infection. The presence of chronic obstructive pulmonary disease was associated with reduced risk of progression to pleural infection, but the following variables were positively predictive: (1) albumin <30 g/l; (2) CRP >100 mg/l; (3) platelet count >400×109/l; (4) sodium <130 mmol/l; (5) intravenous drug abuse; and (6) chronic alcohol abuse. Using two or more points as the cut-off, the sensitivity was 87%, specificity 68.3%, positive predictive value 17.7% and negative predictive value 98.5%. The scoring system requires independent prospective validation. Blood cultures for bacteria are positive in about 14% of patients with pleural infection2 and, when positive, are often the only source of positive microbiology. Blood cultures should therefore be performed in all patients with suspected pleural infection. Empyema should be suspected in all patients who fail to respond to appropriate antibiotic therapy. A pleural effusion may be obvious on the chest x-ray71 and the coexistence of pulmonary infiltrates and fluid should alert the clinician to the possibility of a parapneumonic collection. Lateral chest x-rays may confirm pleural fluid not suspected on the posteroanterior chest x-ray,17 however pleural ultrasonography is widely available and is the preferred investigation. Ultrasound enables determination of the exact location of any fluid collection and guided diagnostic aspiration can be performed if required.71 72 Increasingly, thoracic ultrasound is being performed alongside the chest x-ray in patients with suspected pleural infection. However, unlike chest radiography, ultrasound is not yet routinely available in outpatient settings and out of hours so, for monitoring/follow-up purposes, the chest x-ray remains the initial imaging investigation of choice. Pleural sepsis is occasionally caused by oesophageal rupture and this diagnosis should be suspected in patients who develop a pleural effusion soon after significant retching or vomiting. Diagnostic strategies to identify this important problem are oesophageal imaging (eg, a contrast-enhanced swallow assessment) and measurement of pleural fluid amylase levels which are raised as swallowed salivary amylase enters the pleural space through the oesophageal perforation.73 74 The detection of an oesophageal leak should prompt immediate referral to a surgeon with expertise in the management of oesophageal rupture. Pleural ultrasonography may help to identify pleural infection. In a study of 320 cases of pleural effusion,75 all echogenic effusions were caused by exudates and homogeneous echogenic effusions were due to either empyema or haemorrhage. Correlation between the presence of loculated pleural fluid and a significantly lower pleural fluid pH and glucose and a high LDH concentration has been shown,76 77 although this has not been corroborated by further studies. Contrast-enhanced CT scanning with the scan performed in the tissue phase may be of value in patients when the diagnosis is in doubt or an underlying abnormality is thought either to be associated with the empyema or potentially its cause, such as an oesophageal perforation or bronchogenic carcinoma. CT scanning can help to differentiate pleural empyema from a parenchymal lung abscess and may also help to formulate management decisions about drainage, providing guidance for drain insertion and determination of subsequent tube positioning and success of drainage attempts, and the need for surgical intervention. Typical contrast-enhanced CT appearances of pleural empyema. The image shows a multiloculated pleural collection forming separate lenticular pleural opacities. The ‘split pleura’ sign with enhancing pleural tissue visible on both the visceral and parietal pleural surfaces is shown. MRI is not routinely indicated and offers no advantage over CT scanning for pleural infection; however, it may be considered in specific situations such as allergy to contrast agents or young/pregnant patients where minimising ionising radiation exposure is a particular priority. MRI can also help to define chest wall involvement with the infection (eg, empyema necessitans or tuberculous empyema). If a pleural effusion is identified on the chest x-ray of a patient with possible pleural infection, it is impossible clinically to differentiate the presence of a complicated parapneumonic effusion requiring chest tube drainage from a simple effusion that may resolve with antibiotics alone. There are also no specific data relating to which patients with a parapneumonic effusion can be managed without diagnostic pleural fluid sampling. Sometimes patients seen initially in the community by their general practitioner will have spontaneous resolution of parapneumonic effusions in conjunction with antibiotics without any pleural sampling by the time they present to respiratory specialists. This cohort often present following referral to the outpatient setting with an undiagnosed pleural effusion and repeat imaging confirms radiological improvement. Pleural fluid characteristics remain the most reliable diagnostic test to guide management,17 22–24 77 85–87 and diagnostic pleural fluid sampling is therefore recommended in all patients with a pleural effusion >10 mm depth in association with a pneumonic illness or recent chest trauma or surgery and who have features of ongoing sepsis. Imaging guidance should be used since this minimises risks of organ perforation88 and improves the recovery rate of pleural fluid.89 Sampling using thoracic ultrasound is simple, safer and will reduce patient discomfort (see guideline on pleural investigation).71 89 90 Sampling can be performed by sterile procedure using a needle and syringe with local anaesthetic if necessary. Small effusions (ie, <10 mm thickness) will usually resolve with antibiotics alone.17 25 Observation may be appropriate for these patients, but an increase in the size of the effusion or ongoing sepsis should warrant re-evaluation and diagnostic pleural fluid sampling. Patients in an intensive care unit frequently develop pleural effusions that are not caused by pleural infection.91 It is probably safe to observe such patients with hypoalbuminaemia, heart failure or atelectasis who are at low risk of infection while treating the underlying condition.91 Pleural fluid should be sampled if there are features of sepsis using ultrasound guidance, particularly in patients receiving positive pressure ventilation. The presence of frank pus is diagnostic of an empyema and therefore, following aspiration, the appearance of the pleural fluid should be recorded. The pH of the pleural fluid of all non-purulent aspirates should be measured immediately. Protein concentration and microbiological culture analysis should be routinely requested on all initial samples. Pleural fluid cytology and acid/alcohol fast bacilli analysis for mycobacteria should be performed if clinically indicated. Further details are given in the BTS pleural investigation guideline. Pleural fluid from parapneumonic effusions or empyema is an inflammatory exudate and absolute pleural fluid protein values are of no value in determining the likelihood of spontaneous resolution of the effusion or chest tube drainage requirements.17 23 24 87 Polymorphonuclear (PMN) leucocytes dominate, but the total pleural fluid leucocyte count varies widely between simple effusions and empyemas.24 A predominance of lymphocytes in an exudate should raise the possibility of malignancy or tuberculosis. A patient with pleural infection requiring drainage will develop a pleural fluid acidosis associated with a rising LDH level and a falling glucose level.17 24 85 Data from a systemic meta-analysis reviewing these criteria have justified their use.85 This report showed that a pleural fluid pH of <7.2 is also the single most powerful indicator to predict a need for chest tube drainage, and that pleural fluid LDH (>1000 IU/l) and glucose (<3.4 mmol/l) did not improve diagnostic accuracy. Where pleural fluid pH measurement is not available glucose and LDH should be measured, a pleural fluid glucose level <3.4 mmol/l may be used as an alternative marker to indicate a need for chest drain insertion. However, pleural fluid glucose may be lowered in situations other than pleural infection, such as rheumatoid effusions, and this should be borne in mind when interpreting the result. Pleural fluid cytokine and/or inflammatory mediator levels (eg, IL-8, TNFα, vascular endothelial growth factor or CRP) may be useful to differentiate complicated parapneumonic effusions from other exudative collections.98–101 Further studies are required to elicit their exact role. The presence of organisms identified by positive Gram stain indicates bacterial invasion and implies progression from a simple effusion into a complicated parapneumonic effusion and hence the need for chest tube drainage.17 24 85 86 However, some frankly purulent or culture-positive parapneumonic effusions due to S pneumoniae may resolve with antibiotics alone, avoiding chest tube drainage.18 87 Decisions regarding pleural drainage should be made on an individual basis. Some patients with an initial pleural pH >7.2 will fail to resolve their sepsis syndrome and will need chest tube drainage and even subsequent surgery.57 These occasional cases confirm that, while pleural pH is adequately specific in predicting the need for pleural drainage, it is less than 100% sensitive57 and does not accurately predict mortality or eventual need for surgical intervention.17 57 One reason for this is the heterogeneity of the biochemical characteristics in multiloculated effusions, such that sampling different infected locules can result in markedly different indices of disease severity.97 Unsatisfactory clinical progress therefore indicates a need for repeated pleural fluid sampling and possible chest tube drainage. When needle aspiration is straightforward, it may occasionally be possible to remove all the fluid at initial pleural fluid aspiration. In some cases the fluid will not re-accumulate and no further intervention will be required. Chest tube insertion should be performed in line with the BTS pleural procedures guidelines103 (see page ii61) and recent National Patient Safety Agency recommendations.88 Image guidance should be used whenever available, particularly as many infected effusions will be loculated. The clinical outcome of patients with pleural infection treated with differing sized chest drains has not been addressed in a randomised controlled trial and there remains no clinical consensus on the optimal choice, with widely differing opinions between the medical and surgical specialities. Traditionally, closed chest tube drainage of pus from the pleural cavity has been via large-bore (>28 F) chest tubes inserted without radiological guidance. More recently, flexible small-bore catheters (10–14 F) have been employed, which are easier and less traumatic to insert and may be more comfortable for the patient. In a large randomised trial assessing intrapleural fibrinolytic agents, subanalysis revealed no increased efficacy with large-bore tubes compared with small-bore drains.84 Previously published data suggest that image-guided small-bore catheters can have a good outcome, both as the initial drainage procedure104–108 and as a rescue treatment when larger tubes have failed.104–111 10–14 F catheters are popular in these series and have a low complication rate.71 105 107 111 112 There is, however, still a substantial body of opinion, based on anecdotal clinical experience, which considers large-bore tubes to be more effective for draining thick pus. Sound clinical trials are needed to clarify the optimal chest tube size. No randomised controlled trial data exist evaluating optimal drain management issues such as flushing and drain suction. In most studies assessing small-bore catheters both flushing and suction were used,71 104 105 107 108 111 113 which may improve drainage efficiency by reducing blockage of the catheter from fibrinous debris. Regular flushing (eg, 20–30 ml saline every 6 h via a three-way tap) is therefore recommended for small catheters, preferably administered by trained nurses. Flushing larger bore drains is technically more difficult as these do not routinely have three-way taps and disconnection for irrigation might encourage introduction of secondary infection. For further details on insertion of intercostal chest drains, readers are referred to the BTS pleural procedures guidelines103 and the section in this document on pleural procedures and thoracic ultrasound. A significant proportion of both aerobes and anaerobic organisms from pleuropulmonary infection may demonstrate resistance to penicillin,7 116 117 but β-lactams remain the agents of choice for S pneumoniae118 and S milleri infections.119 120 Aminopenicillins, penicillins combined with β-lactamase inhibitors (eg, co-amoxiclav, piperacillin-tazobactam) and cephalosporins show good penetration of the pleural space.34 121–124 Aminoglycosides should be avoided as they have poor penetration into the pleural space and may be inactive in the presence of pleural fluid acidosis.34 125–128 There is no evidence that administering antibiotics directly into the pleural space offers any advantage. In the absence of positive culture results, empirical antibiotics should be chosen to cover likely pathogenic organisms. There are a considerable number of reasonable drug combinations and the chosen regimen should reflect whether the infection was community- or hospital-acquired, local hospital policies and antibiotic resistance patterns. Pleural effusions may occur in patients with Legionella pneumonia but are usually self-resolving.137 Although Legionella was not identified in a large recent series of UK adult pleural infections,2 it has rarely been reported as a cause of empyema138 and a macrolide antibiotic should be added in proven/suspected cases, although use of these antibiotics is not routinely recommended. Similarly, pleural effusions may occur in 5–20% of patients with pneumonia due to Mycoplasma pneumoniae.139 140 These are usually small reactive effusions which will resolve with suitable antibiotics, but diagnostic pleural fluid sampling may be needed to exclude a complicated parapneumonic effusion or empyema. In all cases, antibiotic regimens should be adjusted according to the subsequent culture results (while remembering that anaerobic pathogens are difficult to grow and having a low threshold for anti-anaerobic coverage). Intravenous administration of antibiotics is often appropriate initially but can be changed to the oral route when objective clinical and biochemical improvement is seen. The duration of treatment for pleural infection has not been assessed in detailed clinical trials, however antibiotics are often continued for at least 3 weeks, again based on clinical, biochemical (eg, CRP) and radiological response. Intrapleural fibrinolytic therapy was first used in 1949.11 More recently, observational series11 145–169 and small randomised trials149 170–178 showed these agents improved pleural fluid drainage, and it was therefore widely assumed they would improve long-term patient outcome. However, a recent large randomised trial showed that these short-term drainage benefits are not associated with reduced mortality, the frequency of surgery, the length of hospital stay or long-term radiological and lung function outcome.84 This trial used intrapleural streptokinase that was associated with an excess of immunological adverse reactions such as fever, leucocytosis and malaise,148 156 165 179 180 but no excess of systemic or intrapleural bleeding and no systemic activation of the fibrinolytic cascade,84 in contrast to previous isolated reports of local pleural haemorrhage,156 163 168 systemic bleeding153 and epistaxis156 associated with its administration.151 Thus, current evidence does not support the routine use of intrapleural fibrinolytic agents. On occasions, such treatment may be indicated for the physical decompression of multiloculated (and so tube drainage-resistant) pleural fluid collections that are responsible for dyspnoea or respiratory failure if discussion with a thoracic surgeon identifies that either surgery is not immediately possible due to additional patient co-morbidity, the feasibility of transfer to a surgical unit or other clinical or logistical reasons. Doses of fibrinolytics used in studies have varied but include streptokinase 250 000 IU daily11 145 147–149 151–157 160 163 165 167 169 170 173–176 179 or 250 000 IU 12-hourly84 151 or urokinase 100 000 IU daily170 171 178 retained for 2–4 h in the pleural space. There is currently interest in other intrapleural agents including combination therapy with fibrinolytics and fluid viscosity and biofilm-disrupting agents such as streptodornase and deoxyribonuclease (DNase).183 184 In experimental/translational studies, this combination reduced infected pus viscosity when compared with fibrinolytics (streptokinase) alone and can disrupt infected biofilms.183–187 Such therapeutic combinations are currently in human clinical trials. Preliminary results from one of these trials suggests that a combination of intrapleural tPA and DNase may provide superior drainage to a fibrinolytic alone, but full publication of these results is awaited. Removal of the chest drain is appropriate after radiological confirmation of successful pleural drainage—that is, reduction in the size of the pleural collection on the chest x-ray or thoracic ultrasound—and objective evidence of sepsis resolution—that is, improvement in temperature and clinical condition and decreasing inflammatory markers (eg, CRP). Inpatient observation for 24 h after drain removal is usual, although a longer period of rehabilitation may be necessary as most patients will have been unwell and in hospital for a prolonged period. In patients who do not respond to antibiotics and chest drainage with ongoing signs of sepsis in association with a persistent pleural collection, the diagnosis should be reviewed and a further chest x-ray and CT scan or thoracic ultrasound performed. Contrast-enhanced thoracic CT scanning more accurately identifies chest tube position, the anatomy of the effusion, presence of pleural thickening and may also identify endobronchial obstruction and mediastinal pathology.188–193 Pleural thickening may represent development of a fibrinous ‘peel’ which may prevent lung re-expansion and hence pleural apposition regardless of adequacy of fluid drainage.188 192 194–196 CT scanning cannot accurately differentiate early from late fibrinopurulent stage disease,82 and pleural thickness on the CT scan does not appear to predict long-term outcome from tube drainage.57 A pleural ‘peel’ may resolve over several weeks and persisting with medical therapy over this period in stable patients may prevent the need for surgery.196 Residual calcification,82 thickening of extrapleural tissues82 and pleural scarring196 may be seen on imaging long after resolution of an empyema. No objective criteria exist to define the point at which surgical intervention for control of pleural infection is required and the decision to operate on a patient remains subjective. Although previous observational studies have indicated that patients with purulent fluid57 and/or loculations102 at presentation are more likely to require surgery, many of these patients will settle without an operation and recent data indicate these features are not predictive.84 197 Patients should be considered for surgery if they have ongoing signs of sepsis in association with a persistent pleural collection despite drainage and antibiotics. Failure of sepsis to resolve within 5–7 days39 198 is suggested as an appropriate period following which a surgical opinion should be sought. Discussion with a thoracic surgeon should be considered in all cases failing to respond. VATS is increasingly used as first-line therapy although open thoracic drainage or thoracotomy and decortication remain alternative techniques. The type of procedure performed will depend on many factors including patient age and comorbidity, surgeons' preferences and local equipment availability. The choice of surgical procedure is beyond the remit of these guidelines and is not considered further. Two small unblinded randomised trials have directly compared surgical and medical therapy. Wait et al12 studied 20 patients with pleural infection who were suitable for general anaesthesia and randomised them to receive either immediate VATS or chest tube insertion (by junior resident medical staff) with additional instillation of intrapleural streptokinase for 3 days. The surgical group had higher primary treatment success (10/11 patients) and all streptokinase medical failures (5/9 patients) were salvaged by surgery without requiring thoracotomy.12 Surgical patients also had a shorter drainage period (5.8 vs 9.8 days) and hospital stay (8.7 vs 12.8 days). The results of this study are of doubtful robustness as the trial was very small, had an unusually high clinical failure rate in the control limb (55%) which explains the positive result, and was not blinded and so open to bias. Bilgin et al199 randomised 70 patients with pleural infection to immediate VATS under local anaesthesia with sedation (n=29) or general anaesthesia if this was not tolerated (n=6) versus chest tube drainage (n=35). Both groups received antibiotic therapy. In the VATS group, initial treatment success was achieved in 82.8% (ie, no indication for subsequent open thoracotomy and decortication) compared with 62.9% in the tube drainage group. The mean hospital stay was 8.3 days for the VATS group and 12.8 days in the tube drainage arm (p<0.05).199 Interpretation of the results, however, should be carefully considered as the authors did not clearly specify the primary outcome measure and the indications prompting further surgical intervention were highly subjective. Further appropriately powered and blinded trials are needed in this area. Ineffective chest tube drainage and persistent sepsis in patients unfit for radical treatment can be approached by a number of ‘less invasive’ options. Re-imaging the thorax and placement of further image-guided small-bore catheters may drain loculated collections105–109 111 and larger bore chest tubes can be tried for ‘thick’ pus.112 Alternatively, patients may proceed to surgical rib resection and open drainage under general or local anaesthesia; continued liaison with a thoracic surgeon should continue in achieving optimal management. The prolonged period (often months) of recovery following this procedure can contribute to increased patient morbidity and this must be discussed with patients during procedural consent. For some patients with empyema who are unfit for radical treatment, further drainage may not be acceptable and, in these cases, ongoing sepsis and impaired respiratory function can lead to an unrelenting decline and subsequent death. When these patients are identified, palliative symptom control delivered by a multidisciplinary team may be appropriate. The role of bronchoscopy in patients with empyema has not been addressed specifically by any studies. In one series, 43/119 patients (36%) with empyema underwent bronchoscopy and tumour was found in only five patients.1 Bronchoscopy is usually performed at the time of surgery by most thoracic surgeons but, again, only a small number of these patients have obstructing tumour predisposing to their empyema.40 Bronchoscopy is therefore only recommended where there is a high index of suspicion for bronchial obstruction—for example, a mass or volume loss on radiographic imaging or a history of possible foreign body which may predispose to the pleural infection itself. Outpatient follow-up with a repeat chest x-ray and inflammatory markers should be arranged for all patients, often within 4 weeks following discharge, and continued outpatient care may be required for several months depending on progress. Persistent elevation of patients' inflammatory markers should prompt further imaging and be interpreted in combination with their clinical status. Patients should be advised to return for prompt medical attention if recurrent symptoms develop since late relapse of pleural infection is well recognised. The long-term survival of patients with pleural infection is good if prompt treatment is initiated. In a series of 85 patients followed for up to 4 years, the mortality was 14% and all deaths occurred within the first 400 days after drainage.57 Deaths were usually due to comorbid conditions and not directly due to sepsis from the empyema. Long-term sequelae of pleural empyema may include residual pleural thickening (up to 13% of patients).200 This is not usually associated with functional impairment although, rarely, extensive incapacitating pleural fibrosis may develop (fibrothorax).135 200 201 Surgical decortication may occasionally provide symptomatic benefit for patients with a fibrothorax. Pleural calcification, bronchopleural fistula formation and development of empyema necessitans (disruption of the parietal pleura with spontaneous discharge of pleural contents evident under the chest wall) are other rare complications.
. The clinical course and management of thoracic empyema. Q J Med 1996;89:285–9. (3).
. The bacteriology of pleural infection by genetic and standard methods and its mortality significance. Am J Respir Crit Care Med 2006;174:817–23. (1++).
. Empyema: an increasing concern in Canada. Can Respir J 2008;15:85–9. (2+).
. Gotthard Bulau and closed water-seal drainage for empyema, 1875–1891. Ann Thorac Surg 1989;48:597–9. (4).
. Empyema thoracis: historical perspective. Ann Thorac Surg 1989;48:306–8. (4).
. Diagnosis and management of thoracic empyemas. Curr Opin Pulm Med 1996;2:198–205. (4).
. Anaerobic bacterial infections of the lung and pleural space. Clin Infect Dis 1993;16(Suppl 4):S248–55. (4).
. Pleural empyema in children. Ann Thorac Surg 1970;10:37–44. (3).
. Empyema of the thorax in adults. Etiology, microbiologic findings, and management. Chest 1993;103:839–43. (3).
. Surgical management of thoracic empyema. J Thorac Imaging 1991;6:80–8. (3).
. The effect in patients of streptococcal fibrinolysin and streptococcal desoxyribonuclease on fibrinous, purulent, and sanguinous pleural exudations. J Clin Invest 1949;28:173–90. (3).
. A randomized trial of empyema therapy. Chest 1997;111:1548–51. (1−).
. Management of pleural space infections: a population-based analysis. J Thorac Cardiovasc Surg 2007;133:346–51. (2+).
. Anatomy of the pleura. Clin Chest Med 1998;19:229–40. (4).
. Mechanical coupling and liquid exchanges in the pleural space. Clin Chest Med 1998;19:241–60. (4).
. Increasing hospital admissions for pneumonia, England. Emerg Infect Dis 2008;14:727–33. (3).
. Parapneumonic effusions. Am J Med 1980;69:507–12. (2+).
. The incidence and clinical correlates of parapneumonic effusions in pneumococcal pneumonia. Chest 1978;74:170–3. (3). American Thoracic Society. Management of nontuberculous empyema: a statement of the subcommittee on surgery. Am Rev Respir Dis 1962;935–6. (4).
. Association between inflammatory mediators and the fibrinolysis system in infectious pleural effusions. Clin Sci (Lond) 2003;105:601–7. (3).
. Immunobiology of pleural inflammation: potential implications for pathogenesis, diagnosis and therapy. Eur Respir J 1997;10:2411–18. (4).
. The diagnostic value of pleural fluid pH. Chest 1980;78:55–9. (3).
. Diagnostic significance of pleural fluid pH and PCO2. Chest 1973;64:591–6. (2+).
. Pleural fluid pH in parapneumonic effusions. Chest 1976;70:328–31. (2+).
. The glucose-pH relationship in parapneumonic effusions. Arch Intern Med 1978;138:1378–80. (2+).
. Serial pleural fluid analysis in a new experimental model of empyema. Chest 1996;109:1043–8. (2+).
. Abnormalities of pathways of fibrin turnover in the human pleural space. Am Rev Respir Dis 1991;144:187–94. (2+).
. The contribution of leukocytes and bacteria to the low pH of empyema fluid. Am Rev Respir Dis 1983;128:811–15. (2+).
. Management of empyema thoracis. Ann Thorac Surg 1990;50:355–9. (3).
. Empyema thoracis. Factors influencing morbidity and mortality. Chest 1991;99:1162–5. (3).
. Bacteriology of empyema. Lancet 1974;1:338–40. (3).
. Aerobic and anaerobic microbiology of empyema. A retrospective review in two military hospitals. Chest 1993;103:1502–7. (3).
. The surgical management of empyema thoracis. J R Coll Surg Edinb 1997;42:15–18. (3).
. Antibiotic therapy of pleural empyema. Semin Respir Infect 1991;6:94–102. (4).
. Thoracoscopy for empyema and hemothorax. Chest 1996;109:18–24. (3).
. Empyema thoracis. Therapeutic management and outcome. Chest 1995;107:1532–7. (3).
. Modern management of adult thoracic empyema. J Thorac Cardiovasc Surg 1985;90:849–55. (3).
. Treatment of spontaneous bacterial empyema thoracis. J Thorac Cardiovasc Surg 1987;94:414–18. (3).
. Improved survival in management of empyema thoracis. J Thorac Cardiovasc Surg 1981;82:49–57. (3).
. Managment of thoracic empyema. Am J Surg 1977;133:474–9. (3).
. Empyema thoracis: 14-year experience in a teaching center. Ann Thorac Surg 1991;51:39–42. (3).
. Treatment of pleural empyema secondary to pneumonia: thoracocentesis regimen versus tube drainage. Thorax 1992;47:821–4. (3).
. The role of early limited thoracotomy in the treatment of empyema. J Thorac Cardiovasc Surg 1988;96:436–9. (3).
. Empyema thoracis during a ten-year period. Analysis of 72 cases and comparison to a previous study (1952 to 1967) Arch Intern Med 1981;141:1771–6. (3).
. A 10-year experience with bacteriology of acute thoracic empyema: emphasis on Klebsiella pneumoniae in patients with diabetes mellitus. Chest 2000;117:1685–9. (3).
. A retrospective review of cases of anaerobic empyema and update of bacteriology. Clin Infect Dis 1995;20(Suppl 2):S224–9. (3).
. A 30-month experience of thoracic empyema in a tertiary hospital: emphasis on differing bacteriology and outcome between the medical intensive care unit (MICU) and medical ward. South Med J 2008;101:484–9. (3).
. The changing pathogens of complicated parapneumonic effusions or empyemas in a medical intensive care unit. Intensive Care Med 2006;32:570–6. (3).
. Outcome of primary empyema thoracis: therapeutic and microbiologic aspects. Ann Thorac Surg 1998;66:1782–6. (3).
. The approach to the patient with a parapneumonic effusion. Clin Chest Med 2006;27:253–66. (4).
. Fungal empyema thoracis: an emerging clinical entity. Chest 2000;117:1672–8. (3).
. Pulmonary melioidosis: clinical-radiologic correlation in 183 cases in northeastern Thailand. Radiology 1988;166:711–15. (3).
. Pleuropulmonary amebiasis. Semin Respir Infect 1997;12:106–12. (4).
. A study of anaerobic infection in patients with empyema thoracis. J Int Med India 2005;8:75–9. (3).
. Empyema: the use of broad range 16S rDNA PCR for pathogen detection. Arch Dis Child 2005;90:70–3. (2+).
. Empyema thoracis: a problem with late referral? Thorax 1993;48:925–7. (3).
. Predictors of outcome and long-term survival in patients with pleural infection. Am J Respir Crit Care Med 1999;160:1682–7. (3).
. Management of parapneumonic effusions. An analysis of physician practice patterns. Arch Surg 1995;130:433–8. (3).
. The effects of early chest tube placement on empyema resolution. Chest 1997;111:1679–83. (1+).
. Do autopsies of critically ill patients reveal important findings that were clinically undetected? Crit Care Med 1998;26:1332–6. (3).
. Risk assessment and prophylaxis of venous thromboembolism in acutely and/or critically ill patients. Haemostasis 2000;30(Suppl 2):77–81. (4).
. Meta-analysis: anticoagulant prophylaxis to prevent symptomatic venous thromboembolism in hospitalized medical patients. Ann Intern Med 2007;146:278–88. (1+).
. Prevention of venous thromboembolism in the ICU. Chest 2003;124:357S–63. (1+).
. Prevention of venous thromboembolism: the Seventh ACCP Conference on Antithrombotic and Thrombolytic Therapy. Chest 2004;126:338–400S. (1−).
. Randomized, placebo-controlled trial of dalteparin for the prevention of venous thromboembolism in acutely ill medical patients. Circulation 2004;110:874–9. (1++).
. BTS guidelines for the management of community acquired pneumonia in adults: update 2009. Thorax 2009;64(Suppl 3):iii1–55. (1++).
. Sequential changes of inflammatory and nutritional markers in patients with community-acquired pneumonia. Scand J Clin Lab Invest 1997;57:111–18. (3).
. Diagnostic and prognostic value of interleukin-6 and C-reactive protein in community-acquired pneumonia. Scand J Infect Dis 1995;27:457–62. (3).
. C-reactive protein is an independent predictor of severity in community-acquired pneumonia. Am J Med 2008;121:219–25. (2+).
. Risk factors for complicated parapneumonic effusion and empyema on presentation to hospital with community-acquired pneumonia. Thorax 2009;64:556–8. (3).
. Percutaneous drainage of infected and noninfected thoracic fluid collections. J Thorac Imaging 1987;2:80–7. (4).
. Quantification of pleural effusions: sonography versus radiography. Radiology 1994;191:681–4. (2+).
. State of the art. The pleura. Am Rev Respir Dis 1988;138:184–234. (4).
. Effusions caused by gastrointestinal disease. In: Light RW, Lee YCG, eds. Textbook of pleural diseases. London: Hodder Arnold, 2008:465–70. (4).
. Value of sonography in determining the nature of pleural effusion: analysis of 320 cases. AJR Am J Roentgenol 1992;159:29–33. (3).
. Sonographic septation: a useful prognostic indicator of acute thoracic empyema. J Ultrasound Med 2000;19:837–43. (2+).
. The prognostic value of loculations in parapneumonic pleural effusions. Chest 1986;90:852–6. (3).
. Imaging of the pleura. Radiology 1993;186:297–309. (4).
. Differentiating lung abscess and empyema: radiography and computed tomography. AJR Am J Roentgenol 1983;141:163–7. (3).
. Pleural exudates and transudates: diagnosis with contrast-enhanced CT. Radiology 1994;192:803–8. (3).
. The extrapleural fat in empyema: CT appearance. Br J Radiol 1991;64:580–3. 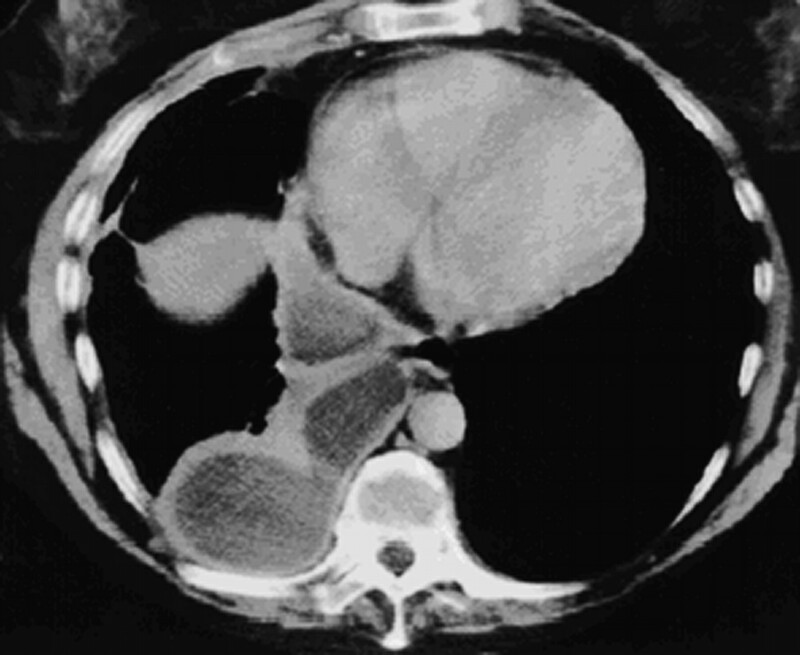 (3).
. Parietal pleural changes in empyema: appearances at CT. Radiology 1990;175:145–50. (3).
. Computed tomography and ultrasound in parapneumonic effusions and empyema. Clin Radiol 2000;55:542–7. (3).
. U.K. Controlled trial of intrapleural streptokinase for pleural infection. N Engl J Med 2005;352:865–74. (1++).
. Pleural fluid chemical analysis in parapneumonic effusions. A meta-analysis. Am J Respir Crit Care Med 1995;151:1700–8. (1+).
. A new classification of parapneumonic effusions and empyema. Chest 1995;108:299–301. (4).
. Utility of pleural fluid analysis in predicting tube thoracostomy/decortication in parapneumonic effusions. Chest 1991;100:963–7. (3). National Patient Safety Agency (NPSA). Rapid Response Report: Risks of chest drain insertion (Reference NPSA/2008/RRR03). 2008:1–10. (4).
. Accuracy of pleural puncture sites: a prospective comparison of clinical examination with ultrasound. Chest 2003;123:436–41. (2+).
. Ultrasound-guided thoracentesis: is it a safer method? Chest 2003;123:418–23. (2+).
. Pleural effusions in the medical ICU: prevalence, causes, and clinical implications. Chest 1997;111:1018–23. (3).
. Clinically important factors influencing the diagnostic measurement of pleural fluid pH and glucose. Am J Respir Crit Care Med 2008;178:483–90. (2+).
. Modification of pleural fluid pH by local anesthesia. Chest 1999;116:399–402. (2+).
. Comparison of pleural fluid pH values obtained using blood gas machine, pH meter, and pH indicator strip. Chest 1998;114:1368–72. (2+).
. Is pH paper an acceptable, low-cost alternative to the blood gas analyzer for determining pleural fluid pH? Chest 1997;112:1291–2. (2+).
. Elevated pleural fluid pH in Proteus mirabilis empyema. Chest 1983;84:109–11. (3).
. Diagnostically significant variations in pleural fluid pH in loculated parapneumonic effusions. Chest 2004;126:2022–4. (3).
. The differential diagnostic values of cytokine levels in pleural effusions. Mediat Inflamm 2005;2005:2–8. (3).
. Role of pleural fluid C-reactive protein concentration in discriminating uncomplicated parapneumonic pleural effusions from complicated parapneumonic effusion and empyema. Lung 2006;184:141–5. (2+).
. Tumor necrosis factor-alpha in pleural fluid: a marker of complicated parapneumonic effusions. Chest 2004;125:160–4. (2+).
. Vascular endothelial growth factor (VEGF) in inflammatory and malignant pleural effusions. Thorax 1999;54:707–10. (2+).
. Predicting factors for outcome of tube thoracostomy in complicated parapneumonic effusion for empyema. Chest 1999;115:751–6. (3). British Thoracic Society. Guidance for the local implementation of local trust policies for the safe insertion of chest drains for pleural effusions in adults, following the NPSA Rapid Response Report. http://www.brit-thoracic.org.uk/Portals/0/Clinical%20Information/Pleural%20Disease/chestdrain-adults.pdf (accessed 2009). (4).
. Radiographically guided percutaneous catheter drainage of pleural fluid collections. AJR Am J Roentgenol 1988;151:1113–16. (3).
. Thoracic empyema: management with image-guided catheter drainage. Radiology 1988;169:5–9. (3).
. Percutaneous drainage of infected and noninfected thoracic fluid collections. J Thorac Imaging 1987;2:80–7. (3).
. Image-guided catheter drainage of the infected pleural space. J Thorac Imaging 1991;6:65–73. (4).
. Percutaneous catheter drainage of pleural effusion and empyema. AJR Am J Roentgenol 1985;144:1189–93. (3).
. “Pigtail” catheter drainage in thoracic surgery. Am Rev Respir Dis 1987;136:174–5. (3).
. Radiologically-guided percutaneous catheter drainage of empyemas. Clin Radiol 1988;39:121–6. (3).
. CT- and ultrasound-guided catheter drainage of empyemas after chest-tube failure. Radiology 1984;151:349–53. (3).
. Interventional radiology of the chest: image-guided percutaneous drainage of pleural effusions, lung abscess, and pneumothorax. AJR Am J Roentgenol 1995;164:581–8. (4).
. Treatment of thoracic multiloculated empyemas with intracavitary urokinase: a prospective study. Radiology 1991;179:771–5. (3).
. Chest tubes. Indications, technique, management and complications. Chest 1987;91:258–64. (4).
. Thoracic drainage. Ann Thorac Surg 1997;63:1497–502. (4).
. Antibiotics in lung abscess. Semin Respir Infect 1991;6:103–11. (4).
. Lung abscess and empyema. Q J Med 1985;57:875–82. (3).
. Antibiotic resistant Streptococcus pneumoniae. Thorax 1996;51(Suppl 2):S45–S50. (4).
. Empyema thoracis and lung abscess caused by viridans streptococci. Am J Respir Crit Care Med 1997;156:1508–14. (3).
. Streptococcus milleri pulmonary disease: a review and clinical description of 25 patients. Thorax 1995;50:1093–6. (3).
. Penicillins. A current review of their clinical pharmacology and therapeutic use. Drugs 1993;45:866–94. (4).
. Serum protein binding and extravascular diffusion of methoxyimino cephalosporins. Time courses of free and total concentrations of cefotaxime and ceftriaxone in serum and pleural exudate. J Antimicrob Chemother 1990;26(Suppl A):1–10. (2+).
. Antibiotic concentrations in human parapneumonic effusions. J Antimicrob Chemother 1981;7:171–7. (2+).
. Antibiotic treatment of patients with pneumonia and pleural effusion. Curr Opin Pulm Med 1998;4:230–4. (4).
. Pharmacokinetics and therapeutic efficacy of gentamicin in an experimental pleural empyema rabbit model. Antimicrob Agents Chemother 1987;31:982–5. (2+).
. Antibiotic levels in empyemic pleural fluid. Chest 2000;117:1734–9. (4).
. Amikacin concentrations in uninfected postthoracotomy pleural fluid and in serum after intravenous and intrapleural injection. Chest 1984;85:502–5. (3).
. Penetration of aminoglycosides in uninfected pleural exudates and in pleural empyemas. Chest 1988;93:530–2. (3).
. Guidelines for management of adult community-acquired lower respiratory tract infections. European Study on Community Acquired Pneumonia (ESOCAP) Committee. Eur Respir J 1998;11:986–91. (4).
. The etiology and antimicrobial susceptibility patterns of microorganisms in acute community-acquired lung abscess. Chest 1995;108:937–41. (3).
. A mechanism of pathogenicity of “Streptococcus milleri group” in pulmonary infection: synergy with an anaerobe. J Med Microbiol 1994;40:118–23. (2+).
. The Streptococcus milleri group as a cause of pulmonary infections. Clin Infect Dis 1995;21(Suppl 3):S238–43. (3).
. Penetration of newer quinolones in the empyema fluid. Eur Respir J 2004;24:466–70. (2+).
. Penetration of clarithromycin in experimental pleural empyema model fluid. Respiration 2005;72:296–300. (2+).
. Management of complicated parapneumonic effusions. Am Rev Respir Dis 1993;148:813–17. (4).
. Present studies of therapy for anaerobic infections. Clin Infect Dis 1996;23(Suppl 1):S9–14. (4).
. Clinicoradiographic correlation with the extent of Legionnaire disease. AJR Am J Roentgenol 1983;141:263–8. (2+).
. Legionnaires' disease presenting with empyema. Chest 1979;75:404–6. (3).
. Frequency of pleural effusions in mycoplasma and viral pneumonias. N Engl J Med 1970;283:790–3. (3).
. Mycoplasma pneumoniae pneumonia. Chest 1989;95:639–46. (3). Department of Health. Screening for meticillin-resistant Staphylococcus aureus (MRSA) colonisation. A strategy for NHS Trusts: a summary of best practice. http://www.dh.gov.uk/reducingmrsa (accessed 2006). (4).
. Epidemiology and outcomes of health-care-associated pneumonia: results from a large US database of culture-positive pneumonia. Chest 2005;128:3854–62. (2+).
. Pharmacologic treatment options for nosocomial pneumonia involving methicillin-resistant Staphylococcus aureus. Ann Pharmacother 2007;41:235–44. (2++).
. Comparison of community- and health care-associated methicillin-resistant Staphylococcus aureus infection. JAMA 2003;290:2976–84. (2+).
. Use of purified streptokinase in empyema and hemothorax. Am J Surg 1991;161:560–2. (3).
. Intrapleural streptokinase in the treatment of haemothorax and empyema. Scand J Thorac Cardiovasc Surg 1977;11:265–8. (3).
. Intrapleural instillation of streptokinase. Effects on systemic fibrinolysis. Thorac Cardiovasc Surg 1981;29:124–6. (3).
. Role of streptokinase in the treatment of acute loculated parapneumonic pleural effusions and empyema. Thorax 1994;49:852–5. (3).
. Controlled trial of intrapleural streptokinase in the treatment of pleural empyema and complicated parapneumonic effusions. Chest 1997;111:275–9. (2−).
. Transcatheter intrapleural urokinase for loculated pleural effusion. Chest 1994;105:1874–6. (3).
. The systemic fibrinolytic activity of intrapleural streptokinase. Am J Respir Crit Care Med 1998;157:328–30. (2+).
. Instillation of fibrinolytic enzymes in the treatment of pleural empyema. Thorac Cardiovasc Surg 1982;30:36–8. (3).
. Major hemorrhage following administration of intrapleural streptokinase. Chest 1984;86:486–7. (3).
. Intrapleurally administered streptokinase in the treatment of acute loculated nonpurulent parapneumonic effusions. Am Rev Respir Dis 1992;145:680–4. (3).
. Intrapleural fibrinolysis with streptokinase as an adjunctive treatment in hemothorax and empyema: a multicenter trial. Chest 1996;109:1514–19. (3).
. Early administration of intrapleural streptokinase in the treatment of multiloculated pleural effusions and pleural empyemas. Thorac Cardiovasc Surg 1996;44:252–6. (3).
. Intrapleural streptokinase in management of parapneumonic effusions. Report of series and review of literature. J Fla Med Assoc 1989;76:1019–22. (3).
. Treatment of loculated pleural effusions with transcatheter intracavitary urokinase. AJR Am J Roentgenol 1989;153:941–5. (3).
. Treatment of complicated pleural fluid collections with image-guided drainage and intracavitary urokinase. Chest 1995;108:1252–9. (3).
. Streptokinase in a loculated pleural effusion. Effectiveness determined by site of instillation. Chest 1988;94:884–6. (3).
. Transcatheter instillation of urokinase into loculated pleural effusion: analysis of treatment effect. AJR Am J Roentgenol 1996;167:649–52. (3).
. Intrapleural urokinase in the treatment of loculated pleural effusions. Chest 1994;105:868–73. (3).
. Intrapleural streptokinase. Thorax 1998;53:720. (3).
. Intrapleural fibrinolytic treatment of multiloculated thoracic empyemas. Ann Thorac Surg 1994;57:803–13. (3).
. Intrapleural administration of streptokinase in complicated purulent pleural effusion: a CT-guided strategy. Intensive Care Med 1996;22:1351–3. (3).
. Intracavitary urokinase therapy as an adjunct to percutaneous drainage in a patient with a multiloculated empyema. AJR Am J Roentgenol 1996;167:643–7. (3).
. Intrapleural streptokinase in the management of empyema. Thorax 1994;49:856–9. (3).
. Intrapleural fibrinolytics in management of empyema thoracis. Chest 1996;110:102–6. (3).
. Use of intrapleural streptokinase in the treatment of thoracic empyema. Am J Med Sci 1990;300:296–300. (3).
. Intrapleural streptokinase versus urokinase in the treatment of complicated parapneumonic effusions: a prospective, double-blind study. Am J Respir Crit Care Med 1997;155:291–5. (1+).
. Intrapleural urokinase versus normal saline in the treatment of complicated parapneumonic effusions and empyema. A randomized, double-blind study. Am J Respir Crit Care Med 1999;159:37–42. (1+).
. Intra-pleural fibrinolytic therapy versus conservative management in the treatment of parapneumonic effusions and empyema. Cochrane Database Syst Rev 2004:CD002312. (1++).
. Randomised controlled trial of intrapleural streptokinase in community acquired pleural infection. Thorax 1997;52:416–21. (1+).
. Intrapleural streptokinase for empyema and complicated parapneumonic effusions. Am J Respir Crit Care Med 2004;170:49–53. (1++).
. Early use of intrapleural fibrinolytics in the management of postpneumonic empyema. A prospective study. Eur J Cardiothorac Surg 2005;28:599–603. (1−).
. Utility of intrapleural streptokinase in management of chronic empyemas. J Assoc Physicians India 2003;51:464–8. (1+).
. Randomised trial of intrapleural urokinase in the treatment of childhood empyema. Thorax 2002;57:343–7. (1+).
. Intrapleural urokinase in the management of parapneumonic empyema: a randomised controlled trial. Int J Clin Pract 2001;55:658–60. (1+).
. Management of complicated parapneumonic effusions with image-guided drainage and intrapleural urokinase or streptokinase: a controlled randomized trial. Eur Respir J 1997;10:325S. (1−).
. Intrapleural streptokinase in experimental empyema. Am Rev Respir Dis 1993;147:962–6. (2+).
. Ventricular fibrillation after intrapleural urokinase. Intensive Care Med 1997;23:352. (3).
. Acute hypoxemic respiratory failure following intrapleural thrombolytic therapy for hemothorax. Chest 1994;105:1595–6. (3).
. The in vitro efficacy of varidase versus streptokinase or urokinase for liquefying thick purulent exudative material from loculated empyema. Lung 2000;178:13–18. (2+).
. Effects of streptokinase and deoxyribonuclease on viscosity of human surgical and empyema pus. Chest 2000;117:1728–33. (2+).
. Effect of aerosolized rhDNase (Pulmozyme) on pulmonary colonization in patients with cystic fibrosis. Acta Paediatr 2006;95:1070–4. (1+).
. Neutrophil enhancement of Pseudomonas aeruginosa biofilm development: human F-actin and DNA as targets for therapy. J Med Microbiol 2009;58:492–502. (2+).
. Extracellular DNA required for bacterial biofilm formation. Science 2002;295:1487. (2+).
. Radiology in pleural disease: state of the art. Respirology 2004;9:300–12. (4).
. The role of computed tomography (CT) in the investigation of unexplained haemoptysis. Respir Med 1992;86:39–44. (3).
. Comparison of CT and fiberoptic bronchoscopy in the evaluation of bronchial disease. AJR Am J Roentgenol 1987;148:1–7. (3).
. Airways and lung: correlation of CT with fiberoptic bronchoscopy. Radiology 1995;197:1–12. (4).
. Imaging of pleural disease. Clin Chest Med 2006;27:193–213. (4).
. Determining the cause of pulmonary atelectasis: a comparison of plain radiography and CT. AJR Am J Roentgenol 1988;150:757–63. (3).
. CT and MR in pleural disease. Clin Chest Med 1998;19:261–76. (4).
. Surgical definition of pleural peel. Radiology 1991;178:889–90. (4).
. CT follow-up of empyemas: pleural peels resolve after percutaneous catheter drainage. Radiology 1990;176:195–7. (3).
. The characteristics and significance of thoracic lymphadenopathy in parapneumonic effusion and empyema. Br J Radiol 2000;73:583–7. (3).
. Early aggressive surgical management of parapneumonic empyemas. Chest 1994;105:832–6. (3).
. Benefits of early aggressive management of empyema thoracis. Aust NZ J Surg 2006;76:120–2. (1−).
. Prognostic features of residual pleural thickening in parapneumonic pleural effusions. Eur Respir J 2003;21:952–5. (2+).
. Prognostic features of residual pleural thickening in metapneumonic pleural effusion. Arch Bronconeumol 1999;35:108–12. (2).
. Non-Hodgkin's lymphoma complicating chronic pyothorax. J R Soc Med 1999;92:89–90. (3).
. Pyothorax-associated lymphoma: a lymphoma developing in chronic inflammation. Adv Anat Pathol 2005;12:324–31. (4).
. Pyothorax-associated lymphoma. J Clin Exp Hematol 2006;46:5–10. (3).
. Non-Hodgkin's lymphoma of the pleural cavity developing from long-standing pyothorax. Summary of clinical and pathological findings in thirty-seven cases. Jpn J Clin Oncol 1989;19:249–57. (3).
. Angiomatous lesions in the wall of chronic pyothorax. Mod Pathol 1995;8:417–20. (3).
. Mechanism for the development of pyothorax-associated lymphoma. Pathol Int 1998;48:653–64. (4).
. Enhanced expression of neuron-specific enolase (NSE) in pyothorax-associated lymphoma (PAL) Jpn J Cancer Res 2002;93:411–16. (3).
. Clinicopathological features of pyothorax-associated lymphoma; a retrospective survey involving 98 patients. Ann Oncol 2007;18:122–8. (3).
. Expression profile of human herpesvirus 8 (HHV-8) in pyothorax associated lymphoma and in effusion lymphoma. Mol Pathol 2001;54:80–5. (3).
. High expression of the Epstein-Barr virus latent protein EB nuclear antigen-2 on pyothorax-associated lymphomas. Am J Pathol 1993;143:1280–5. (2−).
. Commentary: pleural empyema and malignancy–another dimension. Thorax 1996;51:107–8. (4). Competing interests No member of the Guideline Group is aware of any competing interests. Provenance and peer review The draft guideline was available for online public consultation (July/August 2009) and presented to the BTS Winter Meeting (December 2009). Feedback was invited from a range of stakeholder institutions (see Introduction). The draft guideline was reviewed by the BTS Standards of Care Committee (September 2009).